NIVÅ improves acoustics and its design makes it a feature in any room. The panels can be varied to form different patterns in different colours, with or without textile. 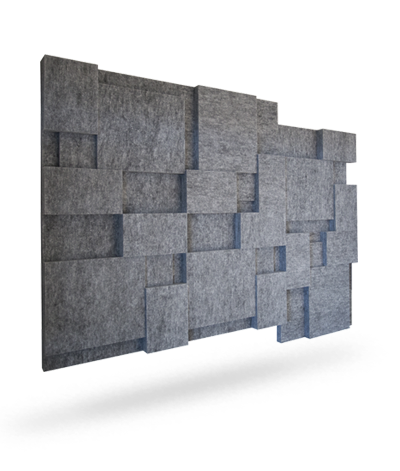 NIVÅ is manufactured in dimensions of 593 x 593 mm in two versions, one to work as a wall panel sound absorbent, the other to fit grid systems for ceilings (edge A). Thickness varies across the surface from 30–80 mm. NIVÅ is made of our unique core material EcoSUND®. New this year are more core material colours and a range of fabric colours that can be laminated onto the absorbent. NIVÅ comes with the smooth surface of the core material EcoSUND® (White, Black or Grey RAW edition), or laminated with Hush fabric on the front. NIVÅ is available for express delivery in RAW edition or with the five express colours of Hush.